Picture provided by Susan Nelson. 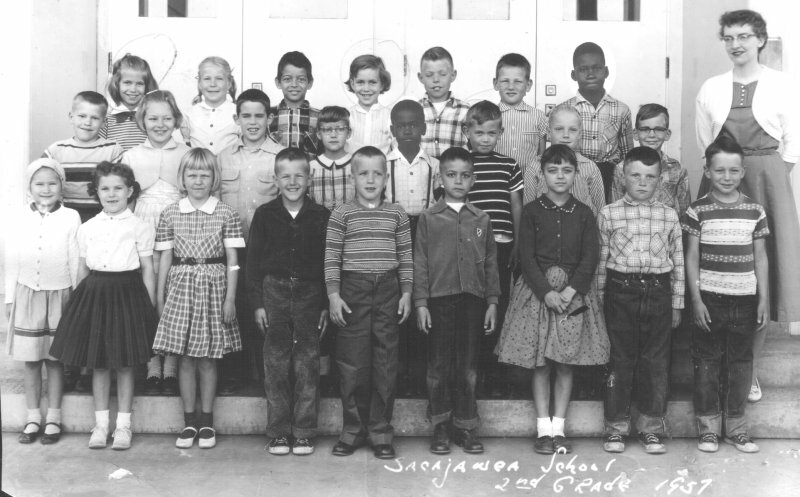 BACK ROW: 1.MyraWeihermiller, 2.JoyHarrison, 3.PaulPage, 4.SusanNelson, 5.GregHansen, 6.TomPatterson, 7._______. MIDDLE ROW: 1.TonyKerr, 2.DianeWilliams, 3.Bruce_______(? ), 4.WandaMcCombs, 5.LenardB.Jones, 6.DeanBergam, 7.Jay_______(? ), 8._______(? )Bison, 9.Mrs.Crumb. FRONT ROW: 1.Linda_______(? ), 2.LindaWatts, 3._______, 4._______, 5._______, 6.GregoryGrady, 7.SusanStull, 8._______, 9._______. E-mail the webmaster with row and # if you can fill in any of these blanks.